Halifax — Citizens of Western countries are breathing a sigh of relief today due to revelations contained in new leaks from the country of North Korea. Information released today indicates that although the dictatorship likely has the capability to build and deliver an estimated 30-kiloton nuclear weapon, presently they are only capable of reaching the east coast of Canada with their existing technology. Dispatches from intelligence sources revealed today that North Korean intercontinental ballistic missile technology does allow the reclusive dictator’s regime to mount a nuclear warhead on an ICBM. However, due to their present level of technological development and geographical restrictions imposed by the curvature of the planet, they are only capable of striking targets in New Brunswick, Nova Scotia and PEI at present. 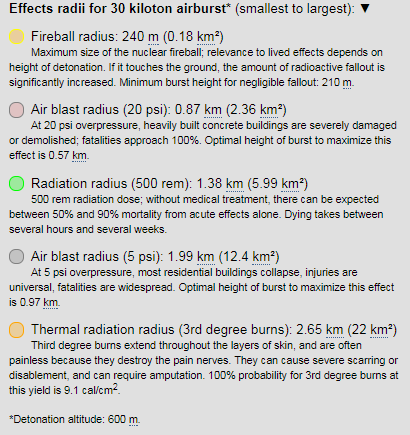 The most devastating damage would be from the nuclear fireball at the epicentre, but the size would be no more than an estimated 0.18 km². 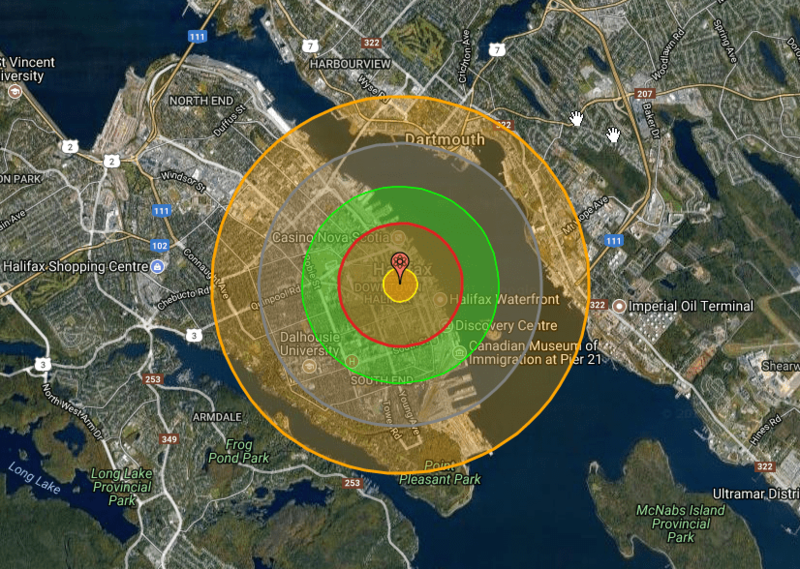 The air blast radius of that 30 kt yield would be around 2.36 km² — enough to topple every building from the Casino Nova Scotia to Citadel Hill to the Museum of Natural History, and as far south as the Discovery Centre. Estimated fatalities would be 100%. The 500 rem radiation radius would envelop from Pier 21 to the MacDonald Bridge to the IWK — around 6 km² — producing 50-90% mortality over several weeks. As a citizen of the Maritmes, Dartmouth NS, this in no way makes me feel safe(er). Infact this is terrifying. Don’t worry Cassandra, chances are the North Koreans aren’t too accurate with their weaponry. I’m betting it would hit closer to the Halifax Shopping Centre in which case all people from Dartmouth would be safe. If you still feel unsafe, I’d suggest moving to Yarmouth. Hi, Mike. I have it on good authority that Kim Erica Jong Ill is peeved with Cheticamp, so Cassandra should be golden.